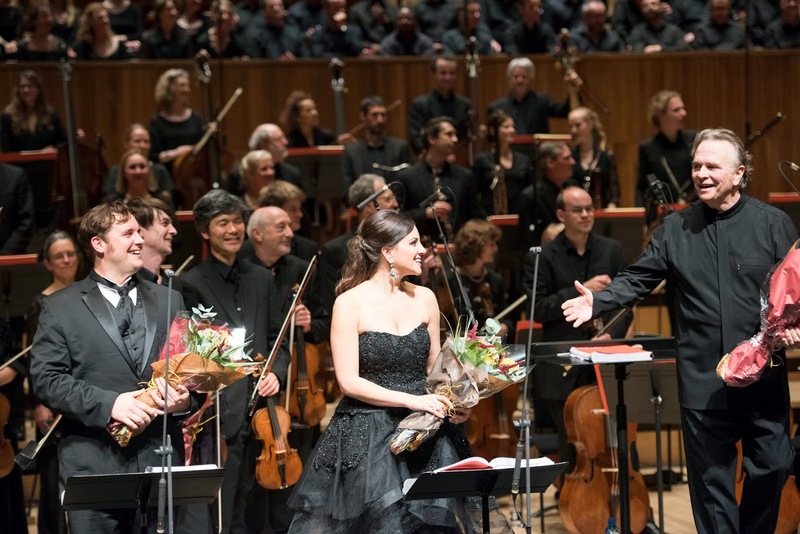 Opera Rara brought a rare performance of Donizetti's first opera for the Paris Opera to the Royal Festival Hall on 4 November 2014, following recording sessions for the opera. Sir Mark Elder conducted the Orchestra of the Age of Enlightenment, Opera Rara Chorus and soloists Michael Spyres, Joyce El-Khoury, David Kempster, Brindley Sherratt, Clive Bayley and Wynne Evans. Donizetti's Les Martyrs was premiered at the Paris Opera in 1840. The work was created in double-quick time and was based on his Italian opera Poliuto, which had been cancelled just before the premiere in Naples owing to the plot's element of religious martyrdom. Such subjects were, however, standard territory for the Paris Opea and Donizetti was able to re-cast the work as a four-act French Grand Opera with ballet to a new libretto by Eugene Scribe.Though Donizetti kept much of the original music it was re-cast into the sort of forms expected by the rather prescriptive Paris Opera. The result is an opera which fascinatingly moves between French and Italian forms so that, for example, Severe has a very Italian caballetta embedded in the very French grand choral finale to Act two. It is a long work, Sir Mark Elder and his forces gave us well over three hours of music even without performing the ballet. And it is written on a large scale, for large forces. The orchestra fielded a complement of around 50 strings, double woodwind plus piccolo and four bassoons (which Donizetti used to lovely effect in the overture), four horns, four trumpets, four trombones and an off-stage banda for four trumpets and three trombones. The French kept valve horns for far longer than anyone else, so the horns were all hand stopped and each had a bewildering array of crooks, and the trumpeters similarly had two or three different instruments. Set in Roman Armenia, the opera opens with the baptism into Christianity of the general Polyeucte (Michael Spyres). But Christians are proscribed, and Polyeucte is married to Pauline (Joyce El-Khoury) who is daughter of the governor Felix (Brindley Sherratt). Felix is introducing new laws threatening execution on anyone who gets baptised. The resulting struggle between pagan and Christian, public duty and private belief, is exacerbated by the fact the the new proconsul come to prosecute the new anti-Christian laws is Severe (David Kempster) whom Pauline once loved (and still does) but though was dead on the battle field. The plot provides plenty of the ceremonial opportunities necessary in French Grand Opera, processions in the dark in catacombs, a Roman triumph, pagan ceremonies and the final throwing of the Christians to the lions in the arena. Donizetti doesn't try to re-invent or re-structure the tradition as Verdi would do, and the work is not the masterpiece that Rossini's Guillaume Tell is, but the music here is rich and rewarding. And the very Italian cast to the melodic material makes for an additional frisson. One of the key scenes, however, would be a problem for modern producers I think. Pauline visits Polyeucte in prison and after he prays, she receives a vision and converts miraculously to Christianity. Donizetti's response is to write some lovely music, unfortunately Pauline responds musically with an elaborate waltz which sounds completely out of key emotionally (though El-Khoury sang it beautifully). But the more personal scenes are very strong, particularly the third act with its confrontations between Pauline and Severe, Pauline and Polyeucte, the questioning of Polyeucte's Christian friend Nearque (Wynne Evans) and finally Polyeucte;s revelation of his Christianity and triumphant cabaletta which concludes the act. This was Donizetti at his best. The role of Polyeucte was written for Gilbert Duprez, one of the singers that effectively invented the modern tenor voice; taking the chest voice up to top C and banishing the elaborate falsetto coloratura that was common until then. Whilst heroic for its time, Polyeucte requires a singer who can combine heroics with stamina, sustaining the high tessitura of the role but still able to sing with finesse and flexibility. The American tenor Michael Spyres has sung quite a number of the tenor roles in the early 19th century French Grand Opera repertoire (we saw him in Auber's La muette de Portici in Paris in 2012) and his performance as Polyeucte was nothing less than heroic. He sang with untiring burnished tone, giving us fine nobility of phrasing and some finely flexible decorative passages. Dramatically he brought strong commitment to the role, making it believable and certainly a lot more than just a string of arias and ensembles. The role of Pauline varied between dramatic declamation and ravishingly elaborated coloratura; it seemed as if Pauline's response to stress was to break out in roulades. El-Khoury not only sang these beautifully, but used her lovely smoky voice to give dramatic weight to Pauline's more vehement moments. You could imagine the role being sung with more weight and bite, but the original Pauline was Julie Dorus-Gras who created Berlioz's Teresa and Eudoxie in Halevy's La Juive - both roles with roulades galore. Like Spyres, El-Khoury brought dramatic commitment as well as technical poise to create a highly sympathetic and ravishing performance. David Kempster was brilliant as Severe, deprived of his love Pauline and required to find clemency for her husband. Kempster let fly brilliantly in the cavatina and caballetta the are part of the act two finale, and elsewhere brought finesse and sympathy to the role. Brindley Sherratt thundered magnificently as the governor Felix, but this was not a one-sided performance and Sherratt showed the character's sympathetic side in his interchanges with his daughter. On the other hand, all Clive Bayley's character of Callisthenes was required to do was thunder and he did so magnificently too. Wynne Evans was Nearque, Polyeucte's Christian friend. This is the second tenor role, required to hang around and sing duets with the tenor and generally start things off before the lead tenor gets the fireworks. Evans sang with some style and showed a real feeling of commitment as the Christian withstood the threats of torture. The Paris Opera required operas to make good use of the chorus and there were plenty of opportunities here for the excellent Opera Rara Chorus, which made up both Christians and pagans. They sang with energy and verve, giving us some lovely detailed singing. Chorus members Rosalind Waters, Andrew Friendhoff and Simon Preece all provide strong support in small solo moments. With a long, unfamiliar score the whole performance could have felt horribly flat but Mark Elder drew a stunning performance out of the orchestra, full of life and energy. They gave some really thrilling vital playing, with copious details articulated brilliantly so that the whole had real vitality. There were also some fine solo moments from individual players. Les Martyrs is not a forgotten masterpiece, but it is by no means a write-off. The mature Donizetti's first response to the challenge of writing French Grand Opera, it is a fascinating transitional work. Written on such a lavish scale, opportunities of seeing it even in concert are rare so Opera Rara are to be congratulated on being able to not only perform it but to do a studio recording as well. And Mark Elder and his forces did the work proud and gave a thrillingly engrossing performance. The opera is released by Opera Rara in April 2015. They have already recorded Donizetti's last work for the Paris Opera, Dom Sebastien and next year will be be recording his aborted project Le Duc d'Albe.